The United Nations aid chief urged the Saudi-led military coalition that controls Yemen’s ports to expedite imports of vital food and fuel supplies, warning that a further 10 million Yemenis could face starvation by year-end. After three years of conflict in which the Yemeni government, backed by Riyadh’s coalition, has fought against Iran-aligned Houthi fighters, Yemen is the world’s worst humanitarian crisis with some 8.4 million people severely short of food and at risk of starvation. “I am particularly concerned about the recent decline of commercial food imports through the Red Sea ports,” Mark Lowcock, UN emergency relief co-ordinator, said in a statement read out to a Geneva briefing on Friday. There are approximately 28 million people in Yemen, and if things stay as they are almost two-thirds of that population will soon be at risk of starving to death. The Saudi coalition bears the largest share of responsibility for Yemen’s humanitarian catastrophe. They are the ones impeding the delivery of commercial goods and aid, and they have it within their power to alleviate the worst effects of the crisis if they would lift the blockade. 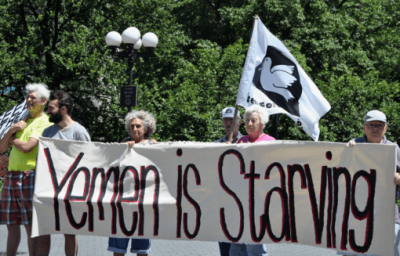 If the coalition presses ahead with an assault on Hodeidah, the crisis is certain to worsen and those additional 10 million people will be driven into famine that much sooner. These are deliberate coalition attacks on civilians made possible by our government’s support, and they happen on a regular basis. The claim that U.S. assistance to the coalition reduces civilian casualties is false, and it is obvious after more than three years of the bombing campaign that the only thing U.S. support has done is make it that much easier for the Saudi coalition to slaughter Yemeni civilians with impunity. That assistance must end, and the U.S. must demand the lifting of the blockade. If the administration does not do these things, it will be responsible for the continued enabling of the killing of countless Yemenis through bombing and starvation.